is a Senior Lecturer in the School of Language Studies and Applied Linguistics at Canterbury Christ Church University, where he directs and teaches on various undergraduate, post-graduate Diploma and MA linguistics and language teacher training programmes. He has taught, trained English language teachers and carried out consultancies in several countries including Hong Kong, Italy, India, Malaysia, Hungary, Austria, Portugal, Spain, Turkey and Switzerland. 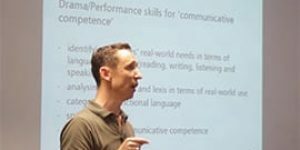 His main areas of interest are in the use of drama in the language classroom and performance-related skills for effective and affective teaching to maximise socio-psychological harmony in the classroom. He has published widely in these and other areas and is often invited to speak at conferences around the world on his areas of expertise. His book ‘Teaching English with Drama’ was published in November 2005 by Pavilion Publishing.